So January is almost over. That’s a thing. I’ve been busy with work, getting a Dungeons & Dragons 5th edition campaign together and playing the video games. I have done some hobby things and done even more thinking about hobby things to plan what I want to get done over the next few months. 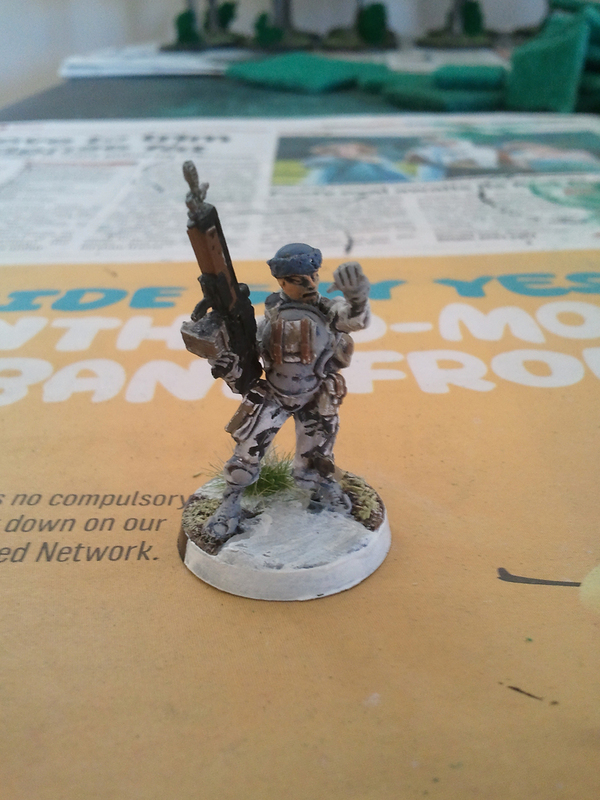 So today we have a couple more Ariadna models that I painted back in the first week of January and some model trees. 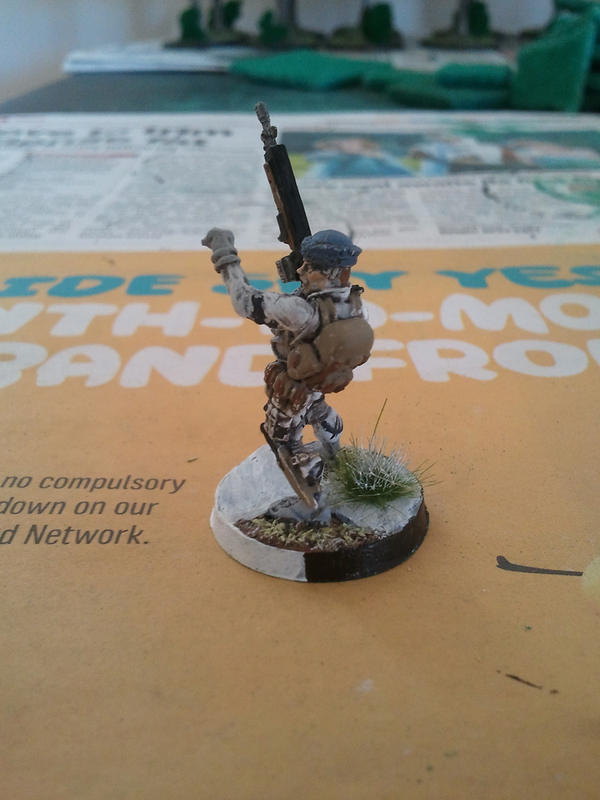 First up we have a line kazak with AP HMG. All very stock standard, nothing special here. 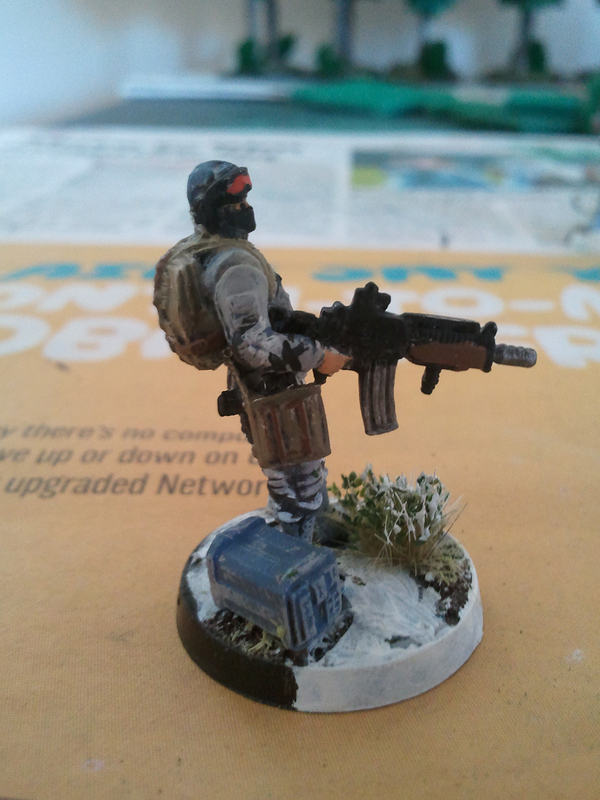 My usual colour scheme, he has a big gun, it shoots bullet at enemy man, etc. The model itself isn’t bad, I’m not sure how I feel about having two Ariadna AP HMG models doing the “fist in the air urah!” pose. 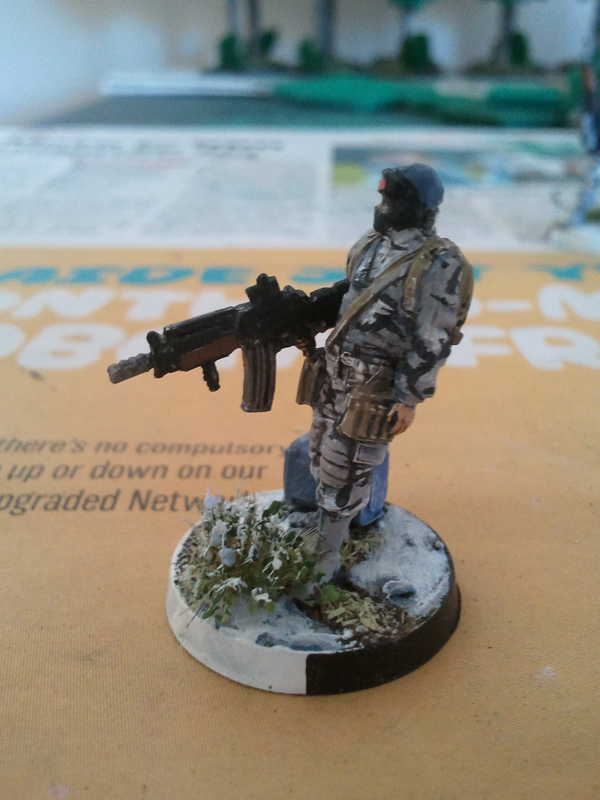 The line kazak model does come with two arm options though, so I only have myself to blame. I can’t remember how the other arm can be positioned, I think it is reaching over to the weapon and I wasn’t that thrilled with it, so I decided to stick with the fist in the air. Next up we have a dozer company engineer with traktor MUL device. 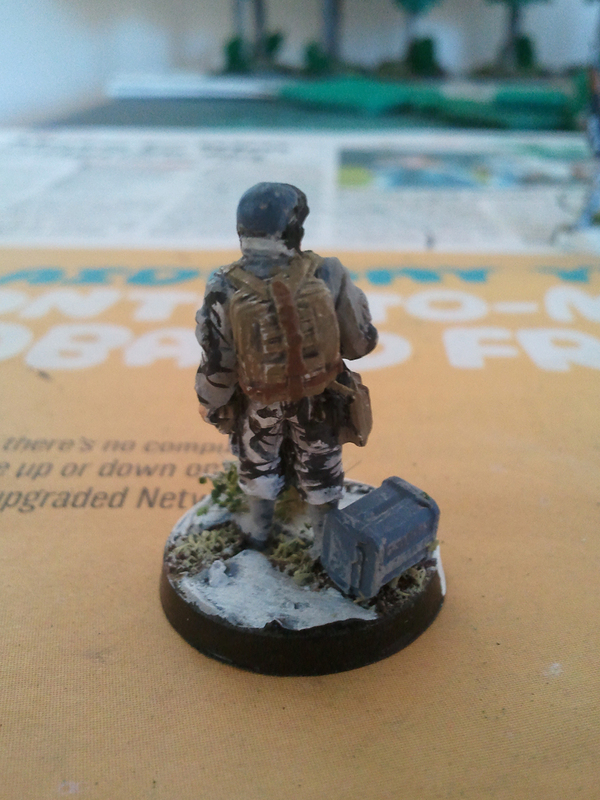 Again, standard colour scheme, although his shirt is plain white only, with camo on the jacket he is wearing. I figured it was pointless to camo the shirt on the grounds that hardly any of it are actually showing. 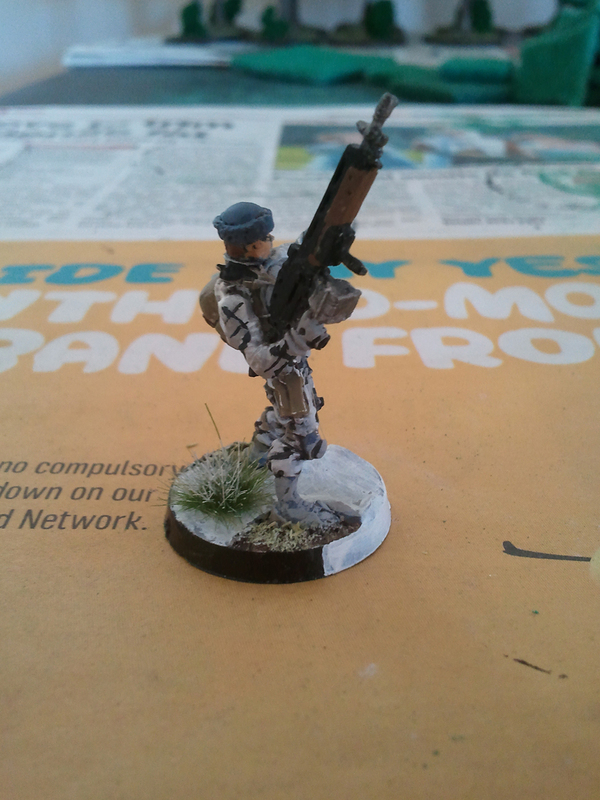 Everything came up pretty nicely on this guy, I was a bit iffy about how he would turn out with my colour scheme. It always works out quite well though, so I’m happy. When I get my taktor MULs together I will be able to use them right away too, which will be Fun. One thing you may notice about this model, however, is that from the side he appears to be leaning backwards. From memory (it was a few weeks ago now I put him together and painted him) I did look to correct this, bending him forward a bit. Thing was if you do that, the way his head and upper torso are, he ends up looking like he is leaning forward. It’s a bit odd. At least that’s my experience. He looks normal from the front and back, just the side that it’s a bit askew. He’s done now though and I’m still pleased. 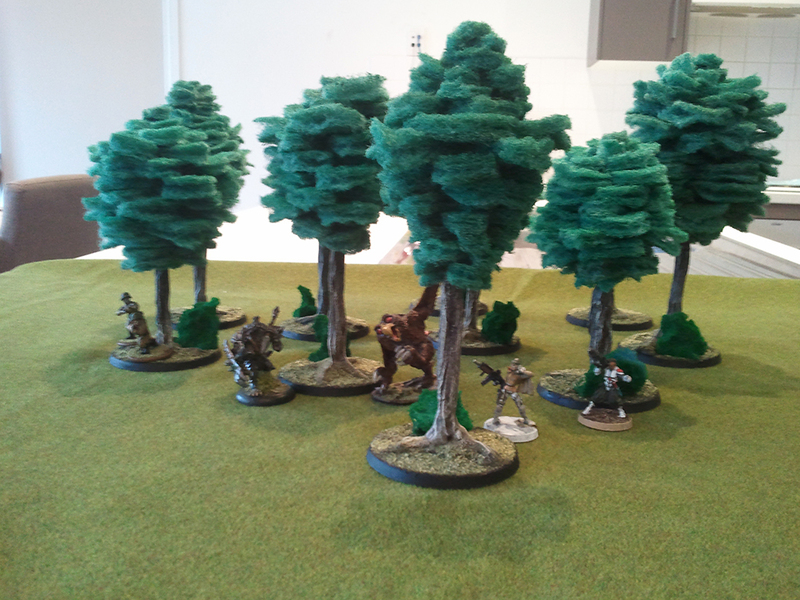 The other thing I’ve done since the start of the year is finally sort out finishing off some trees I was making. 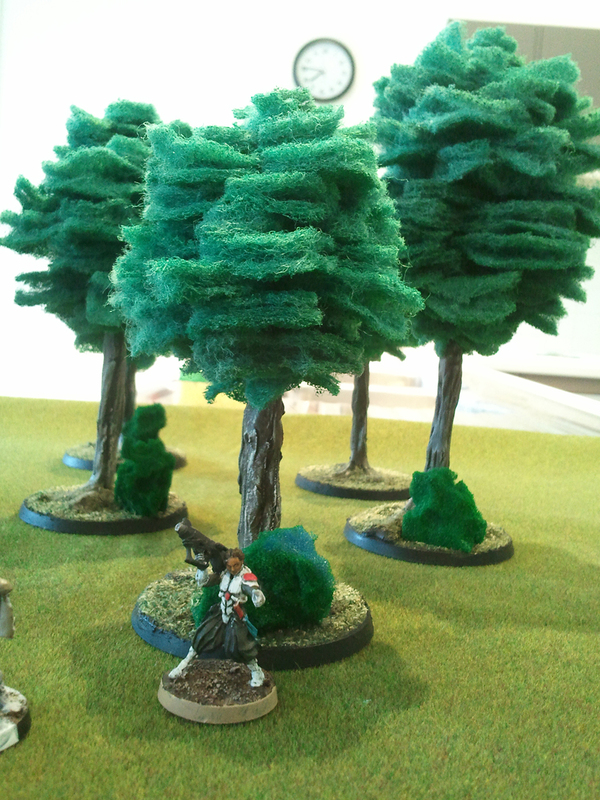 There are a variety of shots below showing off a range of different miniatures that you might be using these trees with. 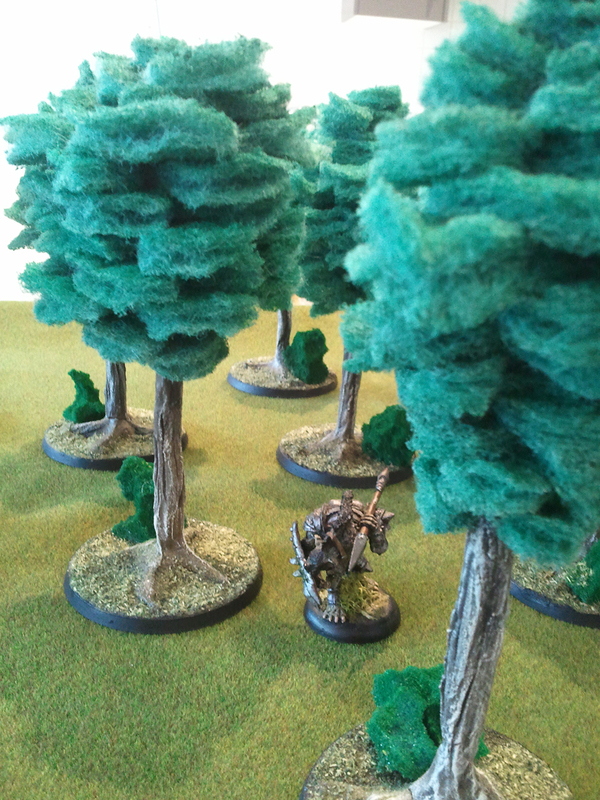 Just be warned that the first one is focused on the foliage, not the miniatures, so it is a bit blurry. 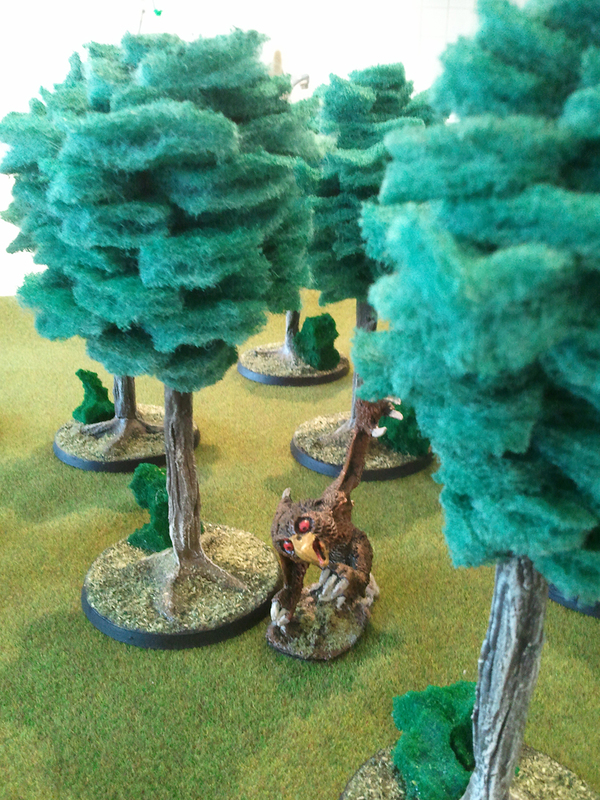 I highly recommend enlarging the image with the owlbear in it, that’s my favourite. 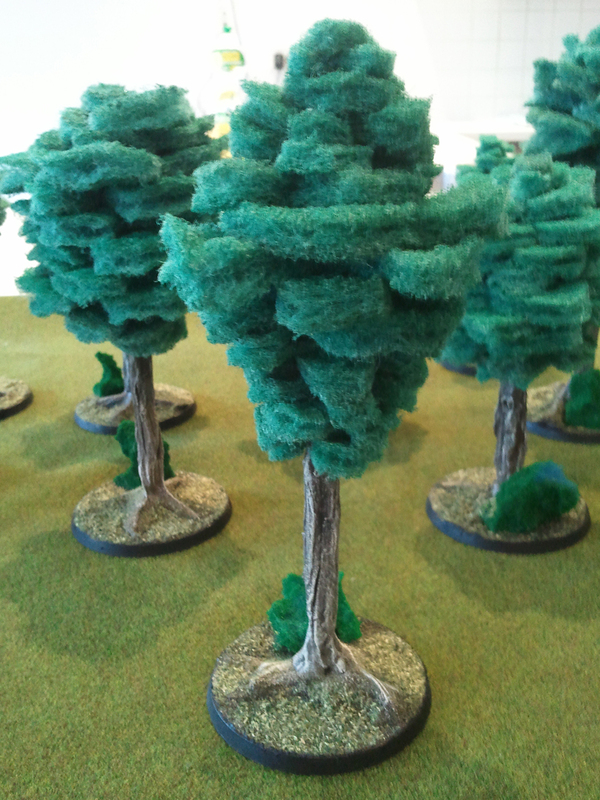 Ever since reading an article on Beasts of War about making trees for the tabletop (http://www.beastsofwar.com/terrain/terrainscaping-awesome-tabletop-trees/) I wanted to give it a crack. 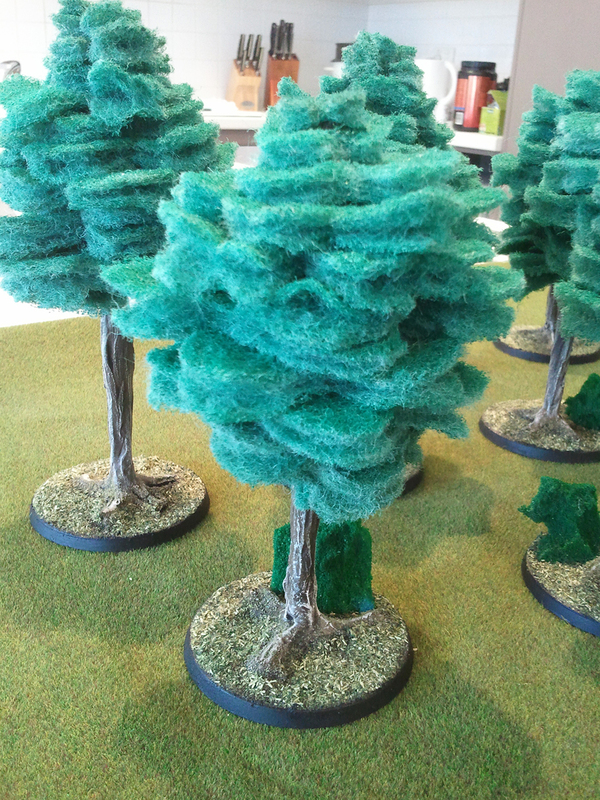 Especially because I have plenty of trees suitable for Flames of War, but nothing really suitable for 28mm games (sure you can use the small trees, but it just doesn’t look right). So I decided that I would follow the Beasts of War article and make 10 trees to start off with – enough to be a forest, not so much that it would take up huge amounts of time and resources and be a waste if my methods turned out poor results. One of the issues with any terrain making article is that it is based in a locality. That is to say the author presents a guide that is based on the resources that are available to him or her, but these may not necessarily be available to others in different localities. On top of that, it’s a good idea to make terrain out of what you have on hand, rather than going out and buying a whole heap of extra stuff for your project. The dowel used in the Beasts of War article I could source, but I already have some 5mm diameter balsa wood, so I decided to use that instead. Secondly, rather than purchase washers for use as bases, I had 10 60mm Games Workshop bases that I had purchased for a (now disbanded) Imperial Guard project. (Using 60mm bases is a significantly more expensive way of bases your trees, but I very much liked the results and would prefer these to washers). Finally, the foliage material used in the article seemed like something that might be hard to hunt down (what do you call it? How are you going to describe it? You’d also quickly find that people want to know your intended purposes, which obviously is not the purposes the product actually exists for). So instead I decided to pick up nylon scourers from my local Coles – the sort of thing you would have used to make Games Workshop’s scourer hedges back in the day (as mentioned in the article). 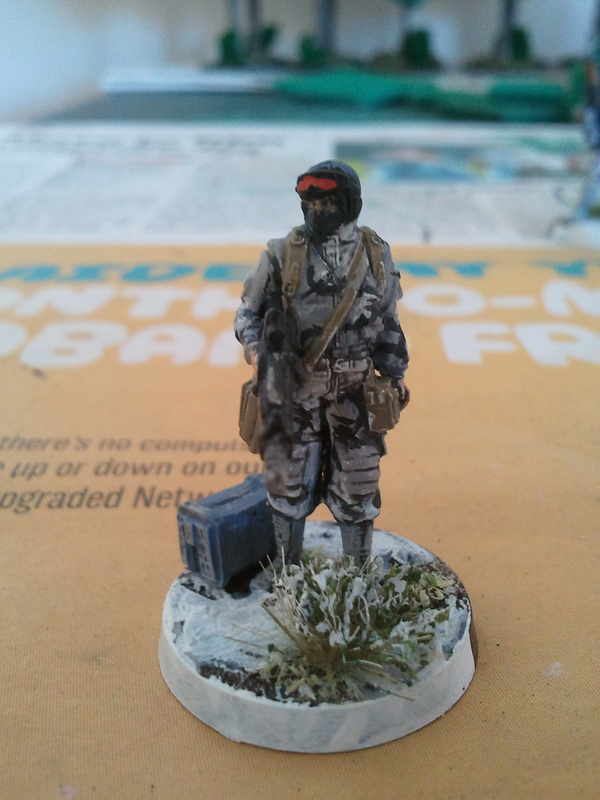 These were cheap, easy to source and best of all they were already green, so I could get away without painting them. 1 – Cut your trunks (5mm diameter balsa wood) into desired lengths and sharpen the tops (I used a pencil sharpener and a Stanley knife). 2 – Put these into the bases by gluing them (PVA glue) into a hole drilled into the centre of the base. 3 – Using wood putty, bulk up the trunk and mould some roots. You don’t need to putty the whole trunk, just up to where the foliage will start. Run your fingernail vertically down the trunk to create some texture (or use a toothpick or a knife blade, I used all three of these methods). 4 – Once the putty dries, glue sand to the bases. Then seal the sand and undercoat black. 5 – Paint the tree trunk and base. I started with burnt umber, followed by burnt sienna then lightened it with yellow oxide (for the trunk and roots) which was then highlighted with unbleached titanium. 6 – Flock your base. 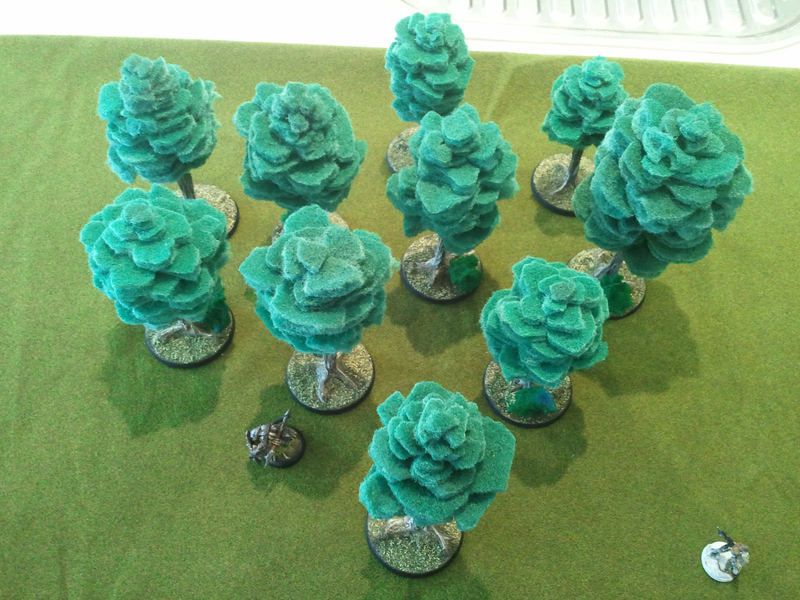 I also pick apart some foam and soaked it in (very) watery green and glued these on most of the trees as bushes. 7 – Cut your foilage material up as in the Beasts of War article: cut out different sized squares (I used 1, 2, 3, 4, 5 and 6cm squares), then turn these into circle-ish shapes with V shapes cut out are regular intervals. Cut a slice in the centre to help slide it on the trunk. I also pulled the layers apart a bit (the scourer is actually like two matted sheets of nylon fibre joined to one another, I pried these apart a bit to add volume). 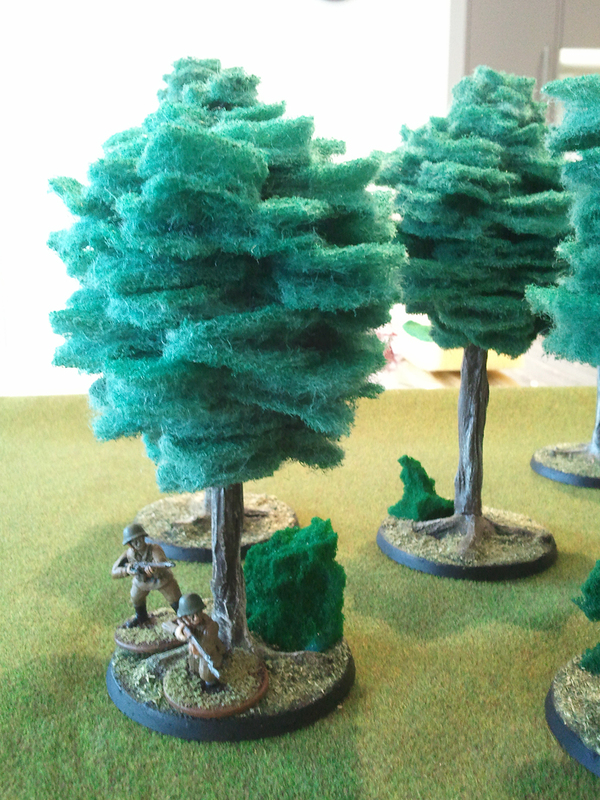 8 – Finally, apply some PVA glue to your trunk (just where you will be sliding the particular layer of foliage to (i.e. enough to do one piece at a time, not the whole trunk) and slide the layer on. 9 – Once dry I neatened the base up around the edges with black. And that’s it, you’re done!